This month we caught up with Lena, one of our skilled vet nurses at our Community Vet Clinic, who works hard to ensure that our dogs and cats get the care they need. We found out more about her challenging yet rewarding role at Mayhew. What exactly does your role involve? I help to prepare cats and dogs for the anaesthetic and surgery. This involves clipping and shaving the fur of the affected area and cleaning it so that it stays sterilised. I monitor the anaesthetic whilst the vet operates on the animal. I also discharge patients once they have recovered enough. If I am not in surgery I am in the hospital ward, usually looking after the animals currently at the Home. This requires cleaning out the patients’ enclosures, feeding and adhering to specific diets, tidying up after the day, making sure the kits are sterilised and giving the patients their medication. I also attend to the other animals at Mayhew who aren’t in the hospital. I give them their worming and flea treatment and help with vet checks. Often vet nurses are able to assess an animal ourselves and give advice if we think they need to be seen by a vet. Of course, I love seeing all the kittens and puppies, but what keeps me motivated is watching the dogs and cats that the Animal Welfare Officers bring in and nursing them back to good health. It is amazing to see an animal that comes in really sick, putting in a lot of effort and then watching them recover and show their true personality. You can get quite attached to some of them, as you always have a favourite! For example, I adore the beautiful white cat called Shelley (pictured) who has been here for months. I have to give her medication every day, yet she is still so sweet-natured and loving, it’s hard not to adore her. What is your least favourite part of the job? When we have to put an animal to sleep. Sometimes it is out of our hands, and despite our best efforts, we have no choice if they are too sick or in too much pain. At that stage, all we can do is make the animal comfortable and give them love and care in their final hours, making sure they feel safe and warm. You have to accept it is part of the job, and you know it is for the best at the end of the day. What advice would you give to others wanting to get into vet nursing? Make sure it is what you want to do as the training is hard work and you have to study. I began by volunteering at Mayhew first as I didn’t know if I wanted to do the job. I decided that I liked it and went to study, as you quickly learn what is involved – It isn’t all cuddling puppies and kittens! There is also a lot of cleaning and practical work involved and you will see a lot of things that will upset you. A lot of people get confused between the differences of being a vet and a vet nurse. What would you like people to know about your job? I think people probably don’t realise how much we do. A question we often get is ‘so when will you become a vet?’ but they are two very different roles. Vets are there to treat and diagnose, whereas vet nurses are there to care for and support animals and vets. We spend more time with the animals. A lot of practices these days rely on vet nurses, and the job descriptions are getting wider and wider. I think it is a rewarding career, and I would encourage anyone thinking of becoming a vet nurse to get involved. 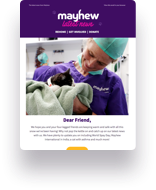 If you are interested in becoming a vet nurse at Mayhew, have a look at our current vacancies. ‘Cracking’ Cattery Easter Party raises over £2,300!